Concept Statement: Abysse is a collaboration between ECAL and Luceplan. I worked with this Italian brand to give a younger and contemporary perspective. For this project, I was interested by the new way to interact directly with the lamp. Inspired by deep-sea creatures, this lamp is fitted with a spring steel arm which delicately suspends the light. Relying on the springy property of the steel, Abysse features an ability to tilt the lamp head to one side or the other for two distinct lighting settings - as a reading lamp or floor lamp. The wall lamp has the possibility to light the wall or to be a reading lamp just by turning the head of the lamp. The very thin arm allows a perfect balance (aesthetic, function and weight) between the base and the lampshade. The lamps are made in aluminium and LED’s discs are used as light source. Project Specs: Floor lamp: 1900x1000x300mm Aluminium (casted and milled), spring steel, polycarbonate, LED disc. Wall lamp: 350x200x200mm Aluminium (casted and milled), spring steel, polycarbonate, LED disc. Bio: Born and raised in Paris, France. Séléna Sieger takes main inspiration from nature. After receiving a Bachelor in Industrial and Product Design at ECAL, she followed her studies in Master of Advanced Studies in Design for Luxury and Craftsmanship at ECAL, Lausanne, Switzerland. She believe that design it's about maintaining and renewing our gestural and material knowledge. Concept Statement: The pendant lighting piece, takes inspiration from spellbinding performances of trapeze artists. Their acts seem magical when artists perform the fast movements perfectly balancing their bodies. Thus it is aptly named KALABAAZ, which in Hindi means an acrobat. Like an acrobat’s asymmetrical balance it captures the moment in the fluid performance and freezes it. The luminaire creates an illusion as if the light itself is performing acrobatics. Thus stationary LEDs create a seemingly kinetic visual. An enchanting sight, this dynamic balance fills the room with vitality exuded by light in motion. Thus it kindles a balance in exuberance and tranquility. Bio: I am an industrial designer from India. Attending six schools has enhanced my ability to understand people of different backgrounds. Coming from a family of engineers my choice of career was a great shock, but I convinced everyone with my strong resolve. In 2017, I began my Masters in Furniture and Fixtures at ArtCenter College of Design, California. A virgo to the core and a multilingual communicator, I find inspiration from my social network. Place of Origin: Vadodara, India. Concept Statement: Balance rise from contrast which we can see it in every corner of our planet. Defect is the reason that we exist and a noun that we can see it in formation of the universe . Light is meaningless, without darkness. And where there is perfection, there is always defect. We believe in that concept of perfection even we know that we will not be able to reach it. We try to reach and keep it alive. Humanity live with defects while searching for perfection and this is the reason why we design, compose and always looking for beauty. I disrupt the perfection when I pierce the circle with asymmetric sticks. The reason of the black color is to show both contrast light and darkness. 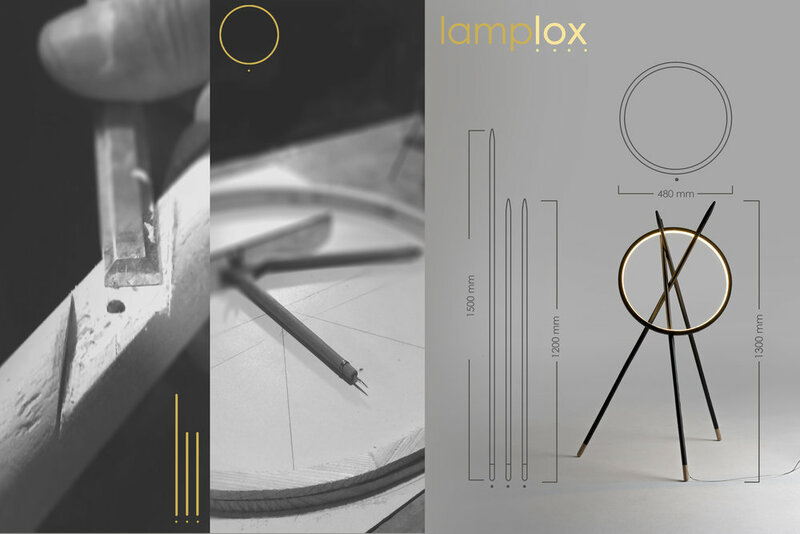 LAMPLOX is a floor lamp which can be used in living room, study room even in bed room. Bio: I was born in İstanbul. I am interested in social sciences. I believe design is an evolution itself. From the beginning, living beings have been designing both their own bodies and environment to survive. I design product, graphic and experience. I get this education under University of Karabük. I like to keep myslef updated with development. I am Mehan , 23 and on my way to graduate this year. Concept Statement: The design and shape of Pengu lamp got its inspiration from penguins whose are wobbling around with their tiny feet. The balance is about where is the center of gravity - the biggest mass of the product. In Pengu lamp is in the bottom where the balancing iron weight is. Because of the weight the torque will bring it always back to upright position if it’s pushed. Lamp is ideal especially for kids or why not for elderly people. It’s playful but still keeps a simple form. The upper shade part can be lifted and it will work as a portable light alone. The battery makes sure it's always ready for use in case of sudden power cut - the battery is charging when it’s plugged. The light can be turned on by pressing the button in the cord or by lifting the shade out of the bottom. Concept Statement: Nature is the origin of balance - A constant act of renewal that refines itself with every cycle. Even as life fades, the remnants of the past remain as alternate forms of beauty. Driftwood is inspired by pristine scenery within nature. It emulates a piece of wood floating on a calm lake, barely breaking the surface and floating without disturbances. The warm diffused light mimics the refraction of light within water, bouncing off the rocky shore and illuminating the floating wood. It is both literally and figuratively “balanced”, as the wooden disc is suspended in the air as if floating on water. The ambient lighting from Driftwood provides the room with a warm, comforting atmosphere. Project Specs: The Driftwood is comprised of two main bodies: the oak disc and the concrete base. The oak is finished with a semi-gloss coating to provide higher reflectance. The concrete provides a diffusing effect, creating a softer light. Neodymium magnets are used to levitate the disc and is controlled by a regulating system via the PCB. With a total diameter of 6", Driftwood fits perfectly in any environment. Bio: Nathan Siu is an aspiring consumer electronics designer studying at Carleton university in Ottawa, Canada. He is currently completing his third year in the Bachelor of Industrial Design. As a spontaneous, curious, and diverse individual, he constantly experiments within the different facets of design. With high proficiency in sketching, prototyping, CAD, and understanding of the design process, Nathan strives to recognize intricate details and amplify them into special, tangible experiences for the user. Concept Statement: The inspiration for the design is the concept of White Balance – camera setting which removes unrealistic colors in the photos. It is necessary, because every light has its own color temperature. Form of lamp is similar to the organ pipes; for instance, each pipe produces specific note which depends on the shape of the pipe. in this particular project, each 'pipe' is an independet element that produces light with different intensity. Therefore, every lamp user can easily change the settings by using a mobile application or manually, by turning the lamp around its own axis. Each element has its own power supply, so everyone can create their unique lamp by composing diferrent forms and lights. Just like the White Balance in cameras can balance different sources of light, the similar principles were applied in Light Of Music in terms of balancing light intensity. Project Specs: Dimensions: 8,9,10,12,15cm Diameter x 10,15,20,30,50,60,80,100,120,130,140cm Height Every single lamp has its own power supply that can be wirelessly charged through a special charger. 'Lamp pipes' are connected in different modules, but there are also single lamps. 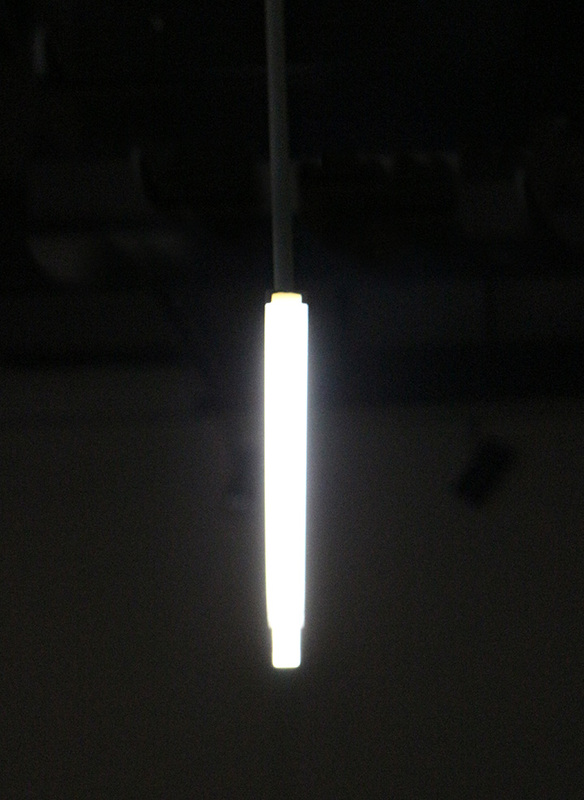 The light source is based on LED diodes placed in a tube-shaped housing. This enclosure is covered with ecru transparent fabric and can be rotated to change light intensity. Bio: I am studying architecture at Poznan University of Technology. I'm interested in art, architecture and design. Concept Statement: The archway has been used throughout the history of civilization to provide balance and structure to great architectural marvels all around the world. The ARCH lamp brings that history into the home in the form of an adjustable light, providing balance between light and dark. When turned on, the ARCH lamp lights up a small portion at the top, symbolizing the “keystone” of an archway, which provides balance and strength to the entire structure. From there, the user can adjust the brightness of the lamp using a touch sensitive control strip along the back of the lamp. As the user slides their hand down the side of the lamp, the light travels down the tube with their touch, creating an archway of light. Project Specs: The top of the lamp consists of a ¾” diameter frosted polycarbonate tube with a adjustable LED strip running through it. The back of the tube has a touch sensitive control strip that runs the entire length of the glass tube, which adjusts the length of the LED strip that is on. The base of the lamp is made out of ¾” diameter steel tubing and a weighted ¾” steel base. 12”x8”x60”. Bio: Noah Howells is a furniture design student at Appalachian State University in Boone, North Carolina, USA. His passions include lighting design and commercial/public furniture design. Concept Statement: More than being strictly a physical attribute, balance is an important element of our mental and spiritual well-being. How we curate the environments in which we live can have a significant impact on this balance. In that vein, Ori is an interactive lighting experience – a series of cubes that allow the user to customize their space to their own needs. 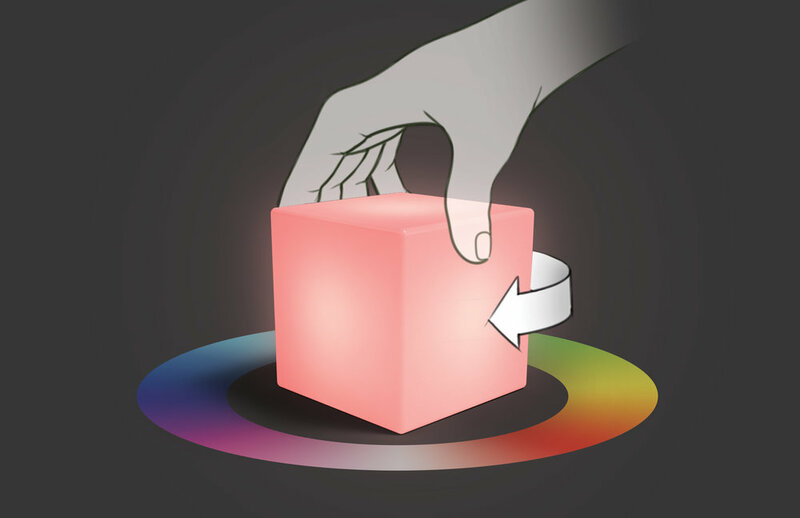 Simply touch each cube to turn on, and rotate in place to change color. It consists of five "light cubes" and one "power cube" – a dock through which the light cubes are charged. The functions mentioned are accomplished through capacitive touch sensors, gyroscopes and inductive charging. Mild magnets help maintain a clean form whenever cubes are in contact with one another. Bio: Jack Judge is a student pursuing his Bachelor’s in Industrial Design at Purdue University. He is passionate about understanding human-centered design, and exploring how design can be used as a force for good in people’s lives. Concept Statement: The most common light we see in daily life is a combination of a round light bulb and a trigonal lamp shade with a current lead. This work deconstructs a light to its original component elements and then regroups them conceptually. Geometric balance relates to the current lead, the lamp bulb and the lampshade, and reanalyzes how all three of them build a balance under some interactions. Concept Statement: Lotus lamp is Anti-Gravity, it makes the light appear to be floating. Inspiration is Lotus floating on the water. Using a magnet Lotus levitates. It creates invisible water and makes the negative space to divide the space. The light is balanced in the air and slowly spinning, the shadow on the celling and floor makes the atmosphere slowdown. Floor lamp: Frame: 1″ × 9 ″, brass tube. Floating lotus:5″ × 3″, PETG. Light: LED, Warm White 2700. Floating: High-strength magnets keep “lotus” floating, with electromagnet, the magnetic field makes it spin. Xiaoyan Wei is a Spacial experience designer. Study at Art Center College of Design. I create spatial narratives which promote the interaction between people. Everything has its own story, I’d like to create furniture which has dynamic beauty. Place of Origin: Pasadena, CA / Qiqihar, China.